Some motorists caught in a huge Texas highway pileup are being credited with saving lives of other victims of a crash that spotlights dangers in holiday travel. NBC's Tom Costello reports. Updated at 6:50 p.m. ET: Two people died and scores of people were hurt Thursday when up to 140 vehicles collided in in dense fog Southeast Texas in a pileup that left trucks twisted on top of each other and authorities rushing to pull survivors from the wreckage. The chain-reaction collision occurred in extremely foggy conditions at about 8:45 a.m. Thanksgiving Day on Interstate 10 southwest of Beaumont, a Gulf Coast city about 80 miles east of Houston. A man and a woman were killed in a Chevy Suburban SUV crushed by a tractor trailer, the Texas Department of Public Safety told KFDM-TV. Jefferson County sheriff's Deputy Rod Carroll said in a news release that 80 to 90 people were transported to hospitals with 10 to 12 of those in serious to critical condition. He said 140 to 150 vehicles were involved in the pileup. According to DPS, a crash on the eastbound side of the highway led to other accidents in a dangerous chain reaction. There were multiple crashes on the other side of the highway as well. "We have 18-wheelers on top of cars, we have cars on top of cars. It's just catastrophic," Carroll told NBC News. Over 100 vehicles collided on Interstate 10 near Beaumont, Tex., on Thursday, as many were headed to visit family for Thanksgiving. Two were killed and 51 were injured, eight critically, as first responders pulled survivors out of wreckage that went for miles. NBC's Janet Shamlian reports. He told The Associated Press the fog was so thick that deputies did not immediately realize they were dealing with multiple accidents. I-10's eastbound lanes were re-opened Thursday evening after more than eight hours. Texas Department of Public Safety trooper Stephanie Davis told KFDM that two people in an SUV died after the crash. She said at least 100 cars and trucks were involved in the accident. Carroll said uninjured drivers tried to help as authorities sorted through the wreckage. "It's just people helping people," Carroll said. "The foremost thing in this holiday season is how other travelers were helping us when we were overwhelmed, sitting and holding, putting pressure on people that were injured." The highway had been crowded with motorists traveling during the holiday. Many of the vehicles were moving close to the posted speed of 70 mph despite dense fog that limited visibility, Carroll said. 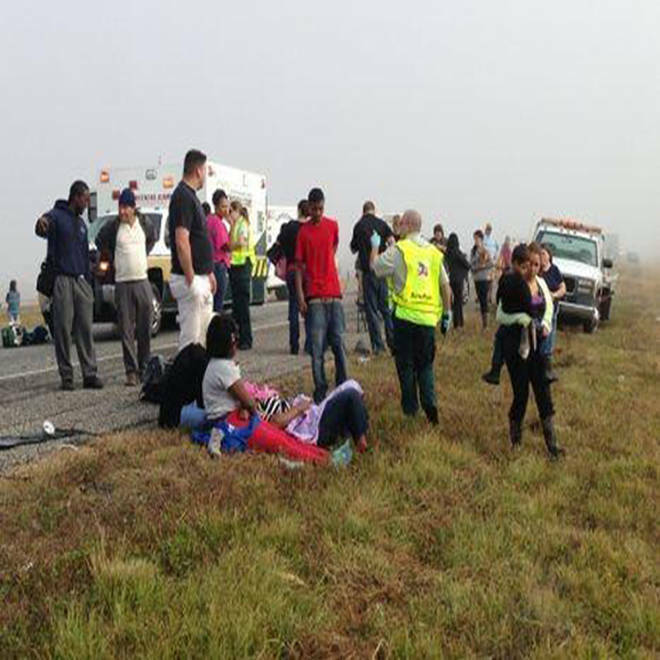 Some of the injured on Interstate 10 in Texas are treated near the crash scene Thursday.